Sunday we left Berea on Hwy 21 and headed into the Appalachians. The roads follow the drainages (creeks or rivers) and then cross a ridge to the next drainage. The top of each drainage has a view of the ridges all around. The grades of the roads are much better than in Missouri; the climb at the end of each drainage has switchbacks and levels out several times during the climb. We went east on 594, 1209, 587, and 30 before reaching Linda's Victorian Rose B&B outside of Booneville. Linda was waiting for us on the gravel drive with flaming red hair and an unstoppable laugh. 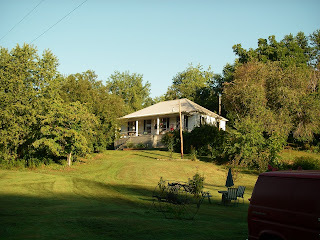 We stayed in the second residence (her old house) on the property and had a wonderful night. Today we headed out at 8:00 and had to stop at the post office in Booneville due to the fog. The fog lies in the drainages in the early morning and can make cycling dangerous due the lack of visibility on windy roads with no shoulder. As the fog cleared we continued on Hwy 28 towards Buckhorn. 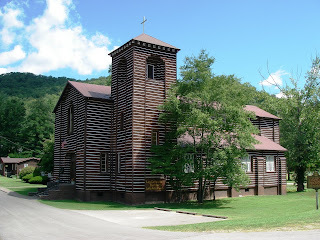 We had a great lunch in Buckhorn next to the log cathedral pictured below which has a full pipe organ imported from Europe early in the 20th century. It seems as if eastern Kentucky is very different than western Kentucky. 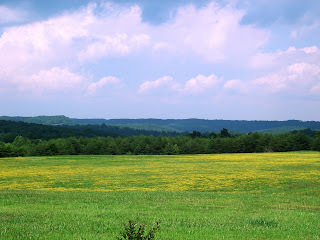 Western Kentucky is rolling grassland and is true to the Indian word for that terrain, Ken-ta-ke. Eastern Kentucky is full of isolated, rural mountain communities. Belinda made an error reading the map between Berea and Booneville and we were soon on a very small road. We saw two men crossing the road ahead of us and decided to ask for directions. They were hunting for herbs and did not know the name of the road. They were friendly and their toothless grins seemed to indicate they had not left the hollow too many times. We had some difficulty understanding their speech which continued today with several of the people we talked with. The country is fairly populated and we pass many houses with hound dogs baying in kennels. 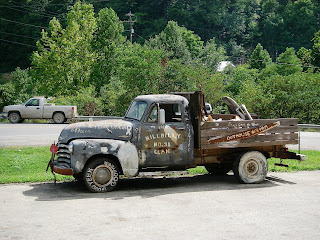 From Booneville, we followed Hwy 28 east until the intersection with Hwy 15 where we saw the truck pictured below. If you click on the picture it will enlarge and show you some very interesting details. We went south on Hwy 15 with a deluge of traffic at 4:00 pm. Luckily there was a large shoulder and we got to Hazard without any problems. Good Morning, who are Bill and Annie? Your ride is coming closer to the end, right? We are a married couple with three really great grown boys. We have retired from careers in agriculture and are looking forward to a future of travel, fun, adventure, and perhaps helping others realize fitness goals. We are exercise addicted and find that Crossfit is simply the best fitness program around. A day without exercise is like a day without sunshine.